Is there any way I can have a slideshow of my photos on my iRiver? 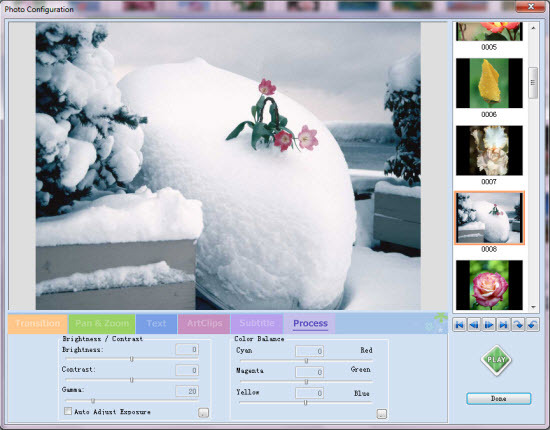 iRiver Photo Slideshow can help you convert photos to iRiver Movie AVI and create photo slideshow playable on iRiver. The steps are as easy as 1, 2, 3. Click the "ORGANIZE PHOTOS" tab to create one or more photo albums. Drag and drop photos from your computer hard drive to the album. 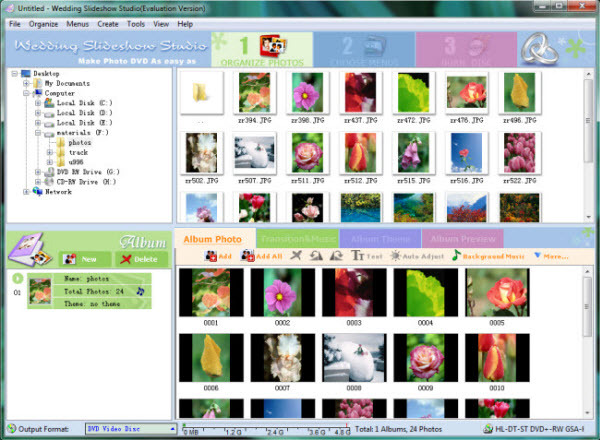 Album Photo: You can add or remove photos, rotate photos, set album thumbnail, arrange the order of the photos, etc. Note: Double click one single photo in the album and you will be able to personalize the photos (transition, Pan & Zoom, Text, ArtClips, Subtitle, Brightness / Contrast, etc.) one by one in the "Photo Configuration" window. Transition &　Music: You can set background music, specify transition effect/duration, photo duration, randomize photo transitions, etc. To set background music for the album, you can add a song from your computer hard drive, insert an audio CD and rip it with the built-in Audio Ripper, record your own voice, etc. You can trim your favorite music clip and also add more than one song as the background music to fit the length of the slideshow. Album Theme: There are lots of album themes available for you to choose from. You may also add separate photos to the beginning and end of the album, and edit album beginning title and ending title, such as text, effect, duration, background color, etc. After making all necessary settings above, choose "Create -> Create Misc Movie". You can also click the "Burn Disc" tab on the interface of iRiver Photo Slideshow and choose "Misc Movie" from the "Output Format" list. In the "Parameter Settings" panel, you can specify output directory, profile, and video/audio parameters such as video bitrate, size, codec, frame rate and audio codec, bitrate, sample rate, channel. Here, you just choose "iRiver PMP 100 (*.avi)" from the profile drop-down list as the output format. Click the "Create Now!" 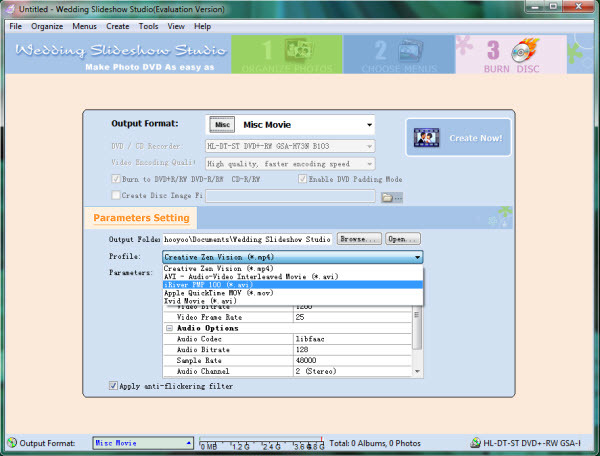 button to starting creating slideshow video for viewing on your iRiver. After the whole conversion process, you can get the output .avi slideshow video file in the default output directory or the one you specified. Then you can feel free to transfer the slideshow to iRiver and enjoy it. Copyright © 2006-2011 Wedding-Slideshow-Studio.com. All rights reserved.